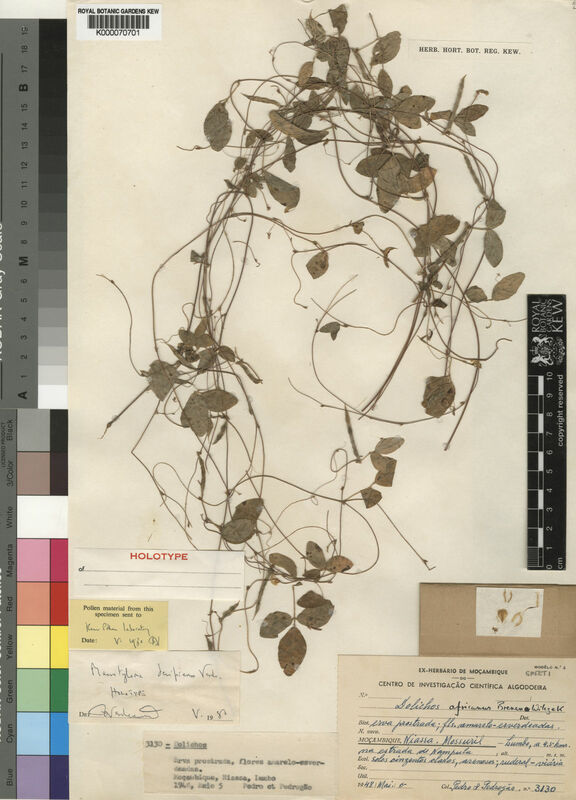 Genus: Macrotyloma (Wight & Arn.) Verdc. This species is accepted, and its native range is Mozambique. Prostrate herb up to 50 cm long; rootstock unknown. Leaves 3-foliolate; leaflets 12–25 × 7–18 mm, elliptic, rounded at the apex, apiculate, shortly rounded and trinerved at the base, glabrous on upper surface apart from ciliate margins and midvein, sparsely pubescent beneath; petiole 8–16 mm long; rhachis 3 mm long; petiolules 1–2.5 mm long; stipules 2–3 mm long, narrowly elliptic; stipels 1–3 mm long, narrowly lanceolate. Flowers axillary, solitary in the axils; pedicels 1 mm long; bracts and bracteoles 1–1.5 mm long, narrowly lanceolate. Calyx pilose; tube 1 mm long; lobes 1.5 mm long, triangular, apex subulate, the upper pair fused along almost all their length. Standard greenish-yellow, 8 × 5 mm, obovate, with appendages 3 mm long; wings 7 × 1 mm; keel 7 × 2 mm. Ovary 4 mm long, glabrous. Pod 2.4–3.4 cm × 2 mm, linear, with a narrow wing-like ridge either side of the sutures, glabrous, beaked, 3–5-seeded. Seeds 4 × 2 × 1 mm; hilum minute, white. Mackinder, B., Pasquet, R., Polhill, R. & Verdcourt, B. (2001). Flora Zambesiaca 3(5): 1-261. Royal Botanic Gardens, Kew. Lock, J.M. (1989). Legumes of Africa a check-list: 1-619. Royal Botanic Gardens, Kew.